Thendele camp is situated in one of the most stunning settings in South Africa and all chalets have a view of the world famous amphitheater. The camp is situated below the sandstone cliffs of Dooley among yellow-wood forests and protea savannah. Visitors can often hear the rumble of boulders in the Tugela river below after a summer thunderstorm. Thendele Camp is the closest camp to the main Drakensberg escarpment. Thendele Camp is dominated by the amphitheater which changes its mood with weather and season. Often covered in snow in winter with up to eighteen waterfalls cascading down the vertical cliffs after a storm, Thendele is a very special place to visit. Thendele Camp is split into an upper and lower section, comprising of 26 self catering chalets. All chalets have satellite TV. 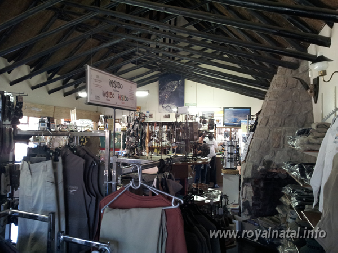 Thendele Camp has a well stocked shop that has curios, basic groceries and supplies.